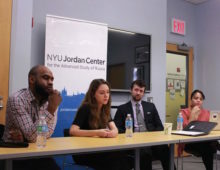 Dr. Wilson said her motivation for organizing this panel was the tendency she saw in the media to explain President Donald Trump’s victory with either “Russia’s interference in the election process” or “an underestimation of white angst.” “What was interesting to me was that these were happening separately,” Wilson said. The three journalists on the panel, in contrast, have been working at the intersection of these two topics. Dr. Wilson then asked Bertrand to comment on what globalism meant in this context, since one of the reasons the alt-right looks to Russia is that Russia appears to lead the fight against globalism. “Putin has made himself a direct opponent of supra-national organizations such as NATO, the EU, the UN” Bertrand said, “which he thinks stand in direct contrast to nationalistic goals, and he shares [this view] with nationalists in the US.” Driving this worldview is the importance of self-determination, and having international organizations dictate what Russia can and cannot do goes against that principle. Regarding the role of anti-semitism in the current alliance, Bertrand said that while many alt-right figures try to distance themselves from the “white supremacist” or “neo-Nazi” label in order to appeal to a wider base, the anti-semitic trope of a “global Jewish oligarchy” promoting Western values such as globalization and multiculturalism is still very much central to their perception of the world. Dr. Wilson then asked the panelists about the genealogy of the present collaboration and if it started with the anti-gay and anti-abortion movements (and laws) in Russia in early 2010s. American conservatives have been trying to gain influence in Russia since the fall of the Soviet Union, Bertrand said, but it accelerated in the late 90s. Starr, on the other hand, argued that attempts to capitalize on the question of race started earlier, during the Soviet Union. One example is the Soviets trying to reach out to decolonizing African countries to influence the continent, for example, through educational opportunities. “The propaganda machine went into full swing in the 50s but it actually started in the 20s with black people studying in different part of the Soviet Union,” Starr said. Starr argued that “black people [in the USSR] had problems from the start, mainly because they were intended to be show pieces, but not full members of society.” This “blackness” included not just Africans or black Americans, but people from the Caucasus, the derogatory term for whom is chorniy, or black (“We are both black,” a Georgian man told Starr). Thus, spending years in post-Soviet space as a black person helps understand the conception of “whiteness” outside of the US context, Starr explained. “In the Soviet context, White is Slavic and Russian, with everyone else in various lower tiers,” Starr said, and added that this includes Ukrainians and Poles, who are perceived as “white trash” in the larger European context. Just as “the larger Soviet experiment never managed to overcome its Slavicness,” according to Starr, today, “the larger conversation on how Russia understands race is very much in parallel with America,” which is also still “struggling to deal with and overcome its whiteness.” If Trump’s platform was indeed about the defense of nation and the state, his white voters would have been more upset about his treatment of state institutions and veterans, for instance. But “Trump supporters voted for him to defend their devalued whiteness, not the state,” Starr argued. Starr said he saw another parallel between the post-Soviet space and the US in the treatment of Holodomor, the state-induced famine in Ukraine in the early 1930s, and how it is treated in today’s Russia in terms of “alternative facts.” “The larger issue with both these countries is dealing with people harnessing the full power of their countries’ respective supremacy, whether white or Russian,” Starr said, and added, “they have different histories but the same objectives.” Michel joined in saying “this is the appeal of Putin for white nationalists in the US, who view him as a model or vehicle of restoring ethnic or white supremacy.” “Alternative facts” do not only operate between Russia and Ukraine either, as evidenced by the anti-semitic rhetoric Starr witnessed in Ukraine, where the dominant group [ethnic Ukrainians] is dealing with its own hegemonic identity issues. Dr. Wilson then asked Michel about Russian support for American secessionist movements (“driven at least in part by racism and xenophobia”). Michel talked about a conference in 2015 in Moscow attended by Western secessionists, which at the time was largely disregarded by the media as a fringe event. “In 2016, the Kremlin took interest and funded in part another conference with individuals from Texas and California,” Michel said. Bertrand also interviewed Luce Marinelli, the leader of the Yes California movement, after she realized the first embassy he set up was in Moscow. “Basically he said they were trying to cultivate countries they know will stand up to the US,” Bertrand recalled. Finally, Dr. Wilson asked Starr about his experience living in Ukraine as a Fulbright scholar, when he focused on how black female Ukrainians were integrating into Ukrainian society. “Ukraine at the time was going through significant political changes [with Yushenko coming into office]” Starr explained, and said he found that “many angles that address political problems either don’t spend a lot of time on race or minorities in these particular countries.” Starr learned during his research that many black Ukrainians have a very negative view of Yushenko for being nationalist, perceiving him as someone who wanted to wipe out all Russian aspects of their own identities. Many people Starr interviewed spoke Russian and thought they weren’t allowed to be part of a “nuanced conversation” on what it means to be Ukrainian. Starr also remarked that American media doesn’t tend to cover the racialized aspect of the conflicts in the post-Soviet space, approaching it as “a bunch of white people fighting each other.” But understanding them as such “helped me to break down how to cover international news so that Americans would actually read it,” Starr said.